On New York's Primary Day, election fever simmered on even after the polls closed. Stephen Hanks took a different turn in his series, Cabaret Campaigns - Ride the Blue Wave, and featured six men from cabaret and theater to sing and talk about their candidate choices for the upcoming November election. Song and talk is basic in the history of cabaret. From Paris, Prague, Vienna, Berlin, Zurich, and London, cabaret has provided an intimate space for artists to stir society through entertainment. 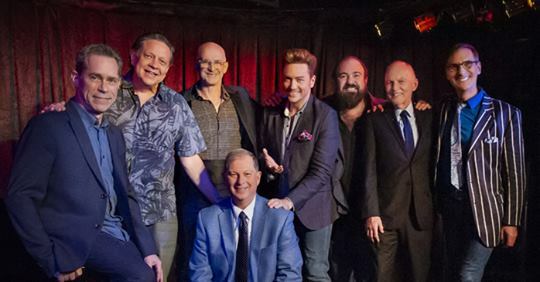 In this divisive year of political awareness, after three all-star variety fundraising shows, raising some $6,000 for Progressive/Democratic candidates in the 2018 elections, the September show was the first to feature men. As it turned out, the men all chose to support women candidates. The show was fast-moving, the singers enthusiastic and their songs reflected their candidates' platforms and why the performers believed in them. The show opened with Hanks singing Michael Roberts' theme song "The Great Blue Wave" ("Come and join/The Great Blue wave/Something less bitter/Less often on Twitter..." You get the message. You don't have to agree, of course, but let's face it, the crowd at Don't Tell Mama was politically savvy and enthusiastically blue. Hanks acted as emcee. A singer himself, mid-show he returned to the mic to deliver an understanding of the hobo life in Don McLean's 1974 folk hit, “Homeless Brother,” reminding us that, "So often have I wondered where these homeless brothers go/Down in some hidden valley were their sorrows cannot show." Rob Davis, supporting Laura Kelly running for Governor of Kansas, sang Willie Nelson's wry, "Still Not Dead" ("The internet said I had passed away/If I died I wasn't dead to stay"), Davis adding his own parody. His second song, Davis' original, "You're the One" reinforces the message of individuality, urging, "Do what you want to do." Davis drives his inspiration home with a scrappy folk spirit. Bruce Clough, singer and cancer survivor, uses his hard-won lessons of strength and survival to find the beauty in life. He is supporting M.J. Heger of Texas, with "Be Prepared," the Elton John and Tim Rice favorite from The Lion King. ("So prepare for the coup of the century/Be prepared for the murkiest scam"). Appropriately, Clough's second song, Oscar Brown's "The Snake," speaks of a conniving politico, although Heger, a mother and combat veteran is prepared for serpentine attacks. As she states, “Congressman Carter hasn’t had a tough race his entire career, so, we’ll show him tough, and then we’ll show him the door." Jeff Macauley shares a focus on education with his candidate, Mary Gay Scanlon, running for U. S. Congress. He opens with Neal Hefti and Bobby Troup's "Girl Talk," a 1965 icky look at women with lines like "They all meow about the ups and downs of all their friends..." Macauley updated to his own parady ("The Constitution is a thing that jerk just doesn’t know"). For his next song, Macauley next parodies, "Walking Shoes," (Gerry Mulligan and Bobby Troup), changing the theme to "Voting Shoes." Hanks calls Mark Nadler, "Cabaret's Superstar" and who can argue that? Extraordinary pianist/singer/actor/dancer/comedian, Nadler supports Abby Finkenaur of Iowa, who is fighting for working families. Choosing Finkenauer, who is Jewish like Nadler, was an opportunity for the entertainer to talk about growing up Jewish in Iowa. Songwriter Larry Kerchner reflected Nadler's remembrances in his song, "Iowa!" and Nadler ended his segment with a salute to our country, a thoughtful and expressive "God Bless America" by Irving Berlin. Mark is a hard act to follow, unless you are Brian Charles Rooney, a versatile tenor who can rock the house down. Here he proved his support for Mary Barzee Flores for Florida's 25th Congressional district. From Richard M. and Robert B. Sherman's "Sister Suffragette" from Mary Poppins, he defiantly delivered, "No more the meek and mild subservients we!/We're fighting for our rights, militantly!" For his second song, Rooney chose Credence Clearwater Revival's protest hit, "Fortunate Son," reflecting class discrimination by the rich men who make war and the poor men having to fight them. ("It Ain't Me. I Ain't No Senator's Son!"). Standout piano accompaniment by Ian Herman punched in the expressive passion of the song. Adam Shapiro threw his support behind Texas' Gina Ortiz Jones. She is running for Texas' 23rd district, Texas-born, a veteran who served in Iraq, a longtime political force, and a strong voice for LGBTQ. Shapiro agrees with the need for equality in the law-making bodies and for his first song, Shapiro finds a personal connection in William Finn's "Republicans" ("I'm in a world surrounded by Republicans/And I’m thinking maybe this proves God is dead.") To follow, he sings a pairing of "A Piece of Sky"/"No Matter What Happens" (Marilyn and Alan Bergman from Yentl), suffused with a hopeful spirit. The proceeds of the evening are donated to the political campaigns designated by the various performers and Stephen Hanks will match the funds raised.